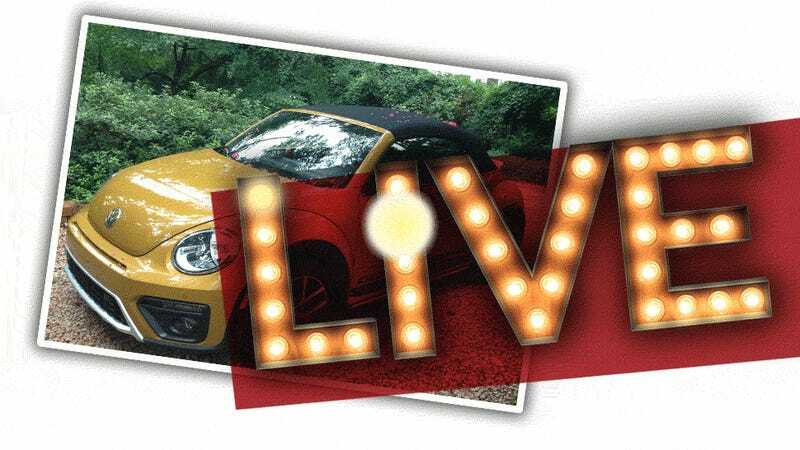 I’ve got one more day with this 2016 Volkswagen Beetle Dune convertible, and I thought that before a full review, you nice people might like some time with it live–well, as live as possible with current technology. You can’t really taste it, yet. The Dune is interesting in that it’s the first car put out by a major automaker to commemorate a famous work of science fiction: in this case, it’s Frank Herbert’s Nebula award-winning novel, Dune. Technically, VW has yet to confirm this, but the one I have seems to be one of the limited-run Frank Herbert Signature Series ones, because it has Frank Herbert’s signature right there on the dash. There’s a few other interesting Arrakis-related touches in the car, which I’ll be happy to point out to everyone. So, join me in checking out this latest re-imagining of the Beetle! I’ll try to do my best to address every question I can, so please, ask away!